I've seen several variations on this theme, some using ginger, some using curry, some using butter, and some using ghee. You can dress it up with garlic, spice it up with red pepper flakes, garnish with cilantro, even add some salt and sugar. Although it's probably best not to do all of that at once. You should choose your flavors. But sweet potato in coconut milk is amendable to all of them in various combinations. 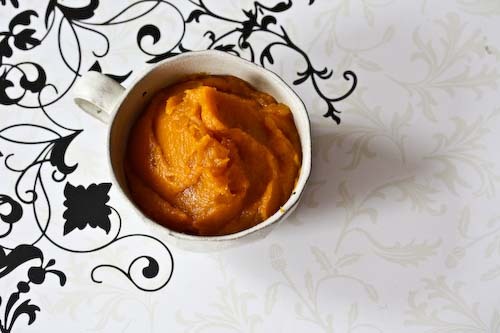 I decided on about the simplest preparation you could hope for, just sweet potatoes whipped with coconut milk and spiked with a bit of white pepper. If you roast your sweet potatoes for a good hour, they'll be tender enough not to need any formal puréeing beyond what a fork is capable of. Then your active time is cut down to nearly seconds, and you won't dirty additional dishes (you can see where my priorities lie). And it'd delicious, and it's naturally vegan. And, if you use light coconut milk, it even qualifies as healthy. In Hawaii, it seems, it's called piele, and although I don't think hawaii can lay the only claim to the combination, since they've given it a name, I'll let them take the credit. 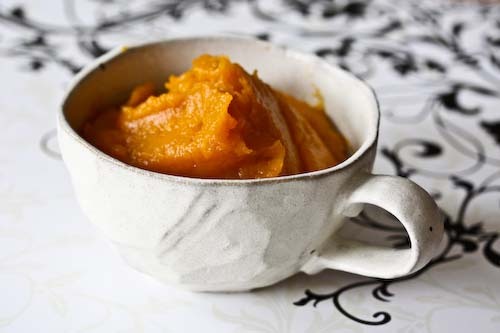 If you like sweet potatoes, you'll love this. If you hate sweet potatoes, then I don't understand you. But that doesn't mean I don't still like you. Maybe this recipe can change your mind. Preheat the oven to 425. Prick the sweet potatoes with a fork, then bake for about 1 hour, until well cooked all the way through. Peel the potatoes, the skins should just kind of slip off. Place the potatoes in a bowl and begin to mash with a fork. They'll be so tender they'll almost instantly turn into a near-purée. As you mash, add some of the coconut milk until you reach your desired consistency. Probably around 3/4 a cup. Add the white pepper to taste and serve. Oh, man...this is another one that's right up my daughter's alley. I like the ginger idea. I love mashed sweet potatoes with butter and milk, but I never thought about adding coconut milk. Just found your site and I'm so glad I did! It's lovely andI'm going to be trying lots of your recipes for sure! With this one in particular, I think you combine the two flavours most comforting to me. I can just picture the mushy, creamy texture... my tummy is making noises now! 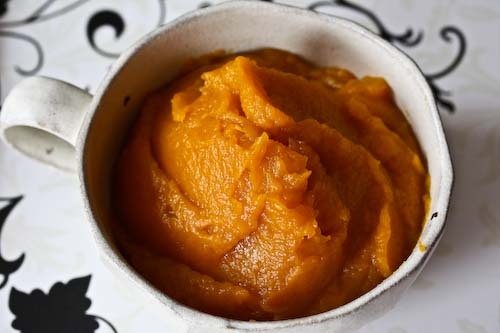 Adding coconut milk to mashed sweet potatoes sounds really good! to be honest, I never gave mashed crazy. but eat from time to time. I like french fries instead. no meal without them! I ate in a while so, but I also left a lot of extreme sports. Those look amazing and are going to be great now that fall is here.